Finance ministers from Northern Ireland, Scotland and Wales have said they should be included in the UK's negotiations to leave the EU. The ministers were speaking after they met in Cardiff to discuss the implications of the EU referendum vote. Voters in Scotland and Northern Ireland opted to remain in the EU in the referendum, while Wales voted to leave. Northern Ireland Finance Minister Máirtín Ó Muilleoir described the meeting as "positive". "We want to speak with one voice to the chancellor - when we speak together, in a united fashion, we speak for 10m people," Mr Ó Muilleoir said. "So despite the fact that we voted in the north of Ireland to remain, the Scottish voted to remain, the Welsh voted to leave, despite that, I think we have made common cause today around some issues we want to bring to the chancellor's table. "We do seek resolution, particularly around this austerity agenda hampering our economic growth." 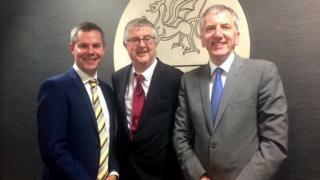 His Welsh counterpart Mark Drakeford said all three nations relied on EU funding. "All three of us have to be determined to hold the United Kingdom to account in delivering the promises that were made to people that money would come in Wales' case to Wales - and that Wales would be better off, not worse off, as a result of leaving the European Union," Mr Drakeford said. "That's a common cause for us all," he said. Scottish Finance Secretary Derek Mackay said: "We want the UK government to respect our position. "We will be issuing a letter to the UK government and we call upon them to give us some financial stability and ensure that we are represented in discussions going forward. "So maybe with a new prime minister we'll get a new attitude from the UK government."